Even better, with there now being one major title--the WWE World Heavyweight Championship--why not use King of the Ring in the way the Royal Rumble is used for the WWE Title? We have all asked for something to happen to make the IC Title relevant, to make it as important as it was when we all grew up. We've seen WWE do tournaments recently to determine the IC Champion or the number 1 contender of the IC title during Raw. So use King of the Ring as the February PPV, and the winner of KotR faces the IC Champ at WrestleMania. 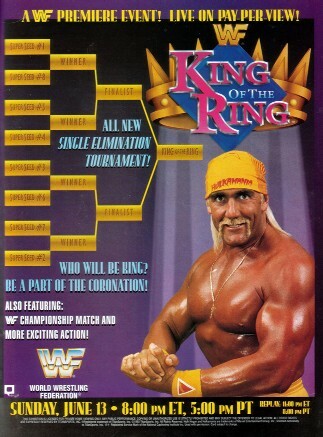 No more of this poorly used or executed “King” gimmick. King BOOKAH annoyed me and for those older than me here at Eyes on the Ring, how many of you guys really stopped calling him “Macho Man” Randy Savage in favor of Macho King? We have the guy most of us wanted with the strap in Dolph Ziggler, and this is a way to give him a platform to stand on--since he isn't (and most likely never will be) in the WWE Title picture. Dean Ambrose, Bray Wyatt, Cesaro, Swagger, (get Stardust outta here and bring back) Cody Rhodes, you can even throw a guy like Randy Orton or Goldust in there to give one of the younger guys a rub in the tourney. And that’s just a few of the names we could toss into the tournament. There's enough talent in the WWE to pull this off. There's so much that can be done with this that could bring the IC Title back to its deserved prominence (Ed. Note: Remember when the IC Belt actually main evented PPVs--or was at least not on the undercard/pre-show? Ultimate Warrior, Shawn Michaels and more do). Make the IC Title and King of the Ring mean something again, WWE.